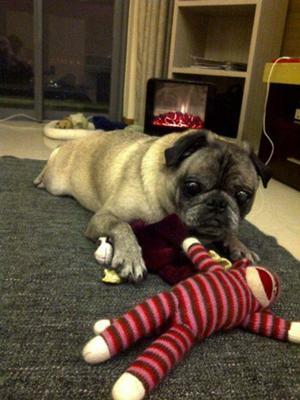 My wife and I are expats living in Shanghai for the last 1.5 years with our 12 year old pug. He's always been healthy and playful, and we've done well to keep his weight in control. Over the last 6 months however, he's had decreased energy, failing vision and hearing, increased belly-weight and weakening hips/back legs. We attributed this to old-age and his dislike of cold, wet Shanghai winters (we're from Sothern California). After a recent 4-day stay with a sitter, where he was very active, he returned with a bad cough. We're fortunate to have a good clinic here where they treat him well and give him lot's of love. We took him in and they diagnosed him with heart disease. After we refused prednisone, they prescribed him a cocktail of 3 daily pills (?). We don't know what they are, but his energy is improved and the cough has gone away. We've noticed that since he began the medication, he's drinking a lot, lot, lot of water and his bowel movements are small and hard. We speak very little Mandarin and the doctors speak no English, so even with our interpreter they're not able to satisfy our desire to understand the details what's happening, how they're treating him, and what to expect next. I'm sure all of his recent problems are interrelated, but can you possibly take some of the mystery out of it(in English) and give us some tips for how we can best help him? 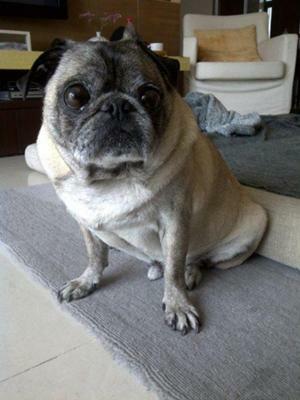 particular case, since I don’t know the details, but I can comment on the type of heart disease that I most commonly diagnose in pugs calleddegenerative mitral valve disease (DMVD). The mitral valve is located between the heart’s left atrium and left ventricle. The valve leaflets that are normally thin and fit together precisely become irregularly thickened, which prevent them from working as they should, and the valve begins to leak. The diagnosis can usually be made when an X-ray reveals an enlarged left atrium and no other potential causes for the characteristic murmur heard during a physical exam, but an echocardiogram (ultrasound of the heart) is sometimes also necessary. A cough is usually the first sign that owners notice in dogs with DMVD. The enlarged left atrium presses up on the dog’s trachea and bronchi leading to airway compression, irritation, and coughing. DMVD is a progressive disease. As the mitral valve becomes increasingly distorted and unable to perform its job, blood flow through the heart becomes increasing compromised which may eventually leading to congestive heart failure (CHF). Before congestive heart failure develops, the value of any medical intervention is questionable. But at the earliest sign of CHF, most veterinarians (in the US at least) prescribe several medications, often enalapril, furosemide, and pimobendan or some combination of similar drugs, to improve heart function and reduce the accumulation of fluid in the body. With luck, these dogs can often maintain a good quality of life for a year or so before their condition declines to unacceptable levels. 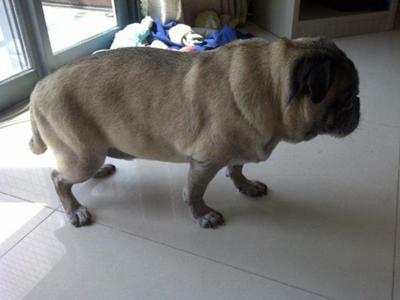 I can’t say with certainty that this is what’s going on with your pug, but based on his breed and age, it seems most likely. Join in and write your own page! It's easy to do. How? Simply click here to return to Heart.